Home ICJR Interviews: Does Early Ambulation Benefit TKA Patients? 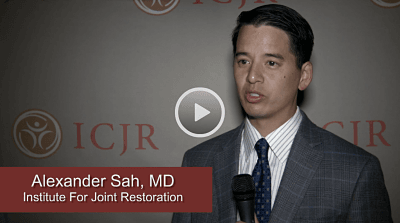 ICJR Interviews: Does Early Ambulation Benefit TKA Patients? Many studies showing the benefits of rapid recovery protocols in total knee arthroplasty (TKA) have focused on a carefully selected patient population. What happens if a surgeon applies a next day discharge protocol to all TKA patients in the practice? Will the benefits still be apparent? The answer is yes, according to a study by Alexander P. Sah, MD, from the Institute for Joint Restoration in Fremont, California. He presented the study, “Initial Experience with Next Day Discharge After Total Knee Arthroplasty” (Poster 177), at the 2016 Annual Meeting of the American Academy of Orthopaedic Surgery in Orlando. Dr. Sah compared outcomes of 150 consecutive patients who underwent TKA after initiation of the next day discharge protocol with outcomes of 150 consecutive patients prior to protocol initiation. Patients in both groups received the same preoperative education, multimodal analgesia, and anesthesia. The only difference was early ambulation in the next day discharge group, with early mobilization defined as mobilization the evening of surgery. Dr. Sah found that all patients in the early ambulation group did better than those in the non-protocol group, even those who were not discharged the day after surgery. Patients in the early ambulation group had better knee range of motion on the day of discharge and at the 2-week postoperative follow-up – with no increase in bleeding or wound complications or readmissions – than patients in the non-protocol group. Click the image above to hear Dr. Sah discuss the study.